This entry was posted on Tuesday, June 16th, 2009 at 10:03 am	and is filed under Gluten-Free Recipes, Seasonal Foods. You can follow any responses to this entry through the RSS 2.0 feed. You can leave a response, or trackback from your own site. I’m already a fan… more so since your advice about beet leaves, so this season I’ve eaten/juiced plenty. Last week in my deli, there appeared beetroot and horseradish chutney but haven’t had time to try it yet. I have a couple odd-ball beet recipes waiting in the wings, one of which I have to recreate, pay attention, and write down what I do. I don’t follow rules (recipes) very well and have a tendency to make things up as I go, which doesn’t bode well when I want to pass along the information to others. Mmmm, beetroot and horseradish chutney? That sounds wonderful. I’m anxious to hear what you think. How was it made? Crikey, I’ve been a regular reader for nearly a year and I hadn’t noticed your email subscription. I’m ever so observant! I didn’t even realise you had a thing for beets. Delicious sounding salad. Just thinking about the beet-stained goats cheese is leaving me slavering, and I’m also eager to hear about Cid’s chutney. Great post once again, Melissa. You Brits have some interesting expressions. Where did crikey come from? You’re much more observant than you give yourself credit for. I just had the email option added to the blog recently. Can’t remember when exactly, but not long ago (maybe a couple of weeks ago). Oh, yes, I do have a thing for beets (a serious thing) and have since I was a little girl. My mom says I thought they were dessert. I’m interested in Cid’s chutney too. It sounds interesting, doesn’t it? Horseradishes and beets? Thanks, GD. I always appreciate your zippy input. Too funny … oh, wait, you said “deadly serious.” I’m sorry. Seriously. I think you need to cook beets for me so I’ll have a full appreciation. I must say they are stunning in the photo. I want to make this recipe just to have the beet juice for all the green smoothies I’ve been making lately. Yippee for the email subscription … I like that! So glad you came across my blog and that I, in turn, have been lucky enough to find yours! It’s beautiful and I can’t wait to explore some more. 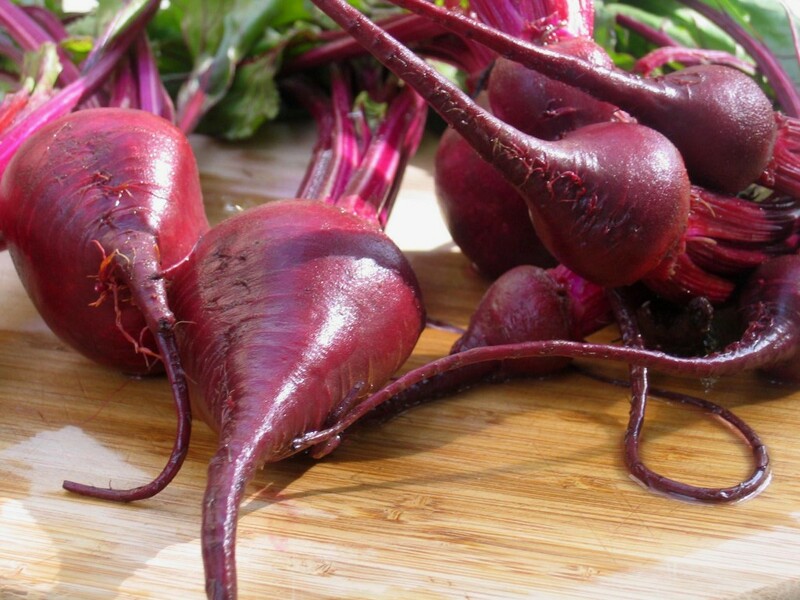 I have to get you on the beet bandwagon. They are so good! Not to mention mysterious. Thanks! It’s nice to have you here. I appreciate the comment. Yeah! Another beet lover. I’m on an experimental jag with beets recently and will be posting a wide variety of recipes soon. Yummmm, Melissa this sounds great! Did you get an ice cream machine yet? I don’t have one and that’s why all my ice cream recipes are blender friendly I would like to get one though so let me know how it goes. Anyway- I’m printing this recipe. Yumlicious. As a fellow lover of beets, I love the quote and your salad recipe! I think all of your recipes are similar to mine – we just seem to cook with the same ingredients. That is why I always love to see what you are doing! I bet a bit of thinly sliced fresh basil would be a great addition here. Your photos are so pretty -That’s what I call: eye candy! Nobody says it quite like Tom Robbins, I say! Truly — what vegetable is there more worthy of passion than the lovely beet? I’m behind in my comment responses, so if you look ahead, you’ll see that I did get an ice cream maker. Yeah! Can’t wait to try different versions. Yes, we are on the same page with our ingredients and basil is one of my favorites. Definitely a good idea with this salad. Thanks! Basil and goat cheese love each other! Thanks so much for your kind words! Eye candy — I like that. You’re so right. Tom Robbin’s is definitely one of a kind! This is my first year for a CSA and I am enjoying your blog. I started eating mostly raw food last summer, and am learning to eat lots of veggies that I never knew existed – or how to prep, like beets! Thanks. Welcome — and thanks so much for commenting! You are going to be hooked on your CSA (where are you?). I am totally addicted to my Grant Farms deliveries. In fact, when they end for the season, I go into mourning!